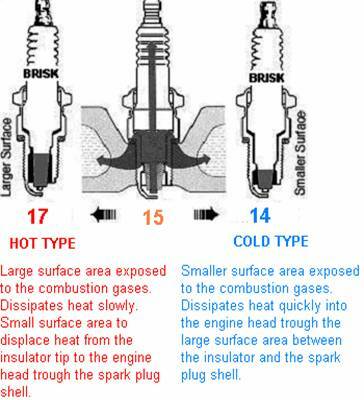 Autolite spark plug heat range is generally indicated by the last digit of the part number. Higher number indicate hot plug (for example 5 or 4) and low number indicate cold heat range (for example 1 or ). 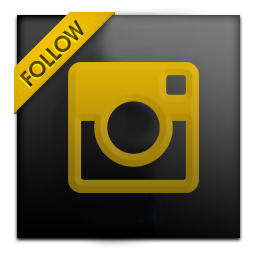 Run hot enough to burn off combustion deposits that would otherwise collect on the sparkplug insulator tip and cause fouling, that leads to misfire. Two basic conditions for proper performance of a spark plug are given by sufficient electrical insulation between the center and ground electrodes, and heat transfer from the parts of the spark plug projected into the combustion chamber. Both conditions are directly related. In order to ensure sufficient insulation between center and ground electrodes it is necessary, to keep the insulator tip (the part of the insulator projecting into the engine area) within an optimum temperature range. 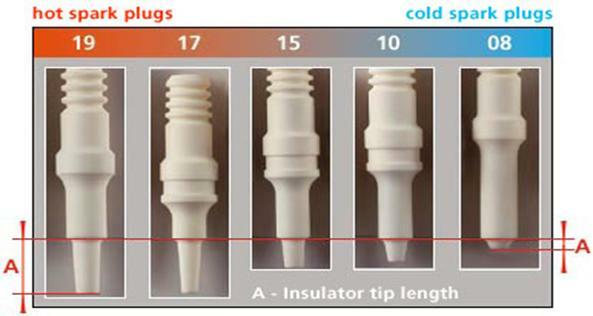 Insulator tip temperature is influenced by the proper choice of spark plug heat range. 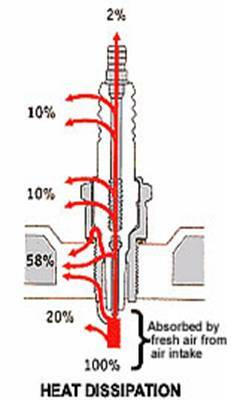 One heat range changes the spark plug insulator tip temperature by about 75 - 100 degree Celsius. I nert zone - in this zone, there does not occur any setting of combustion deposits on the insulator tip and there does not occur any self-cleaning either. No deposits set on the insulator tip surface even if the spark plug temperature drops below 500 0 C. The new spark plug does not feature any fouling and if a spark plug is fouled, it does not get cleaned.